This lovely semi-detached character cottage is located next to a working farm on the edge of Burton-in-Kendal village, with views to the open countryside beneath Farleton Knott in the South Lakes. On entering this cottage you will immediately see its character, from the old barn doors used for the downstairs cloakroom to the stone walls in the dining and living areas, with the wooden original shutters at the windows, large beams and vaulted ceiling. The sitting room has a large woodburner in the centre with a seating area to the front and back with a lovely beamed fireplace. Upstairs, there are three generous bedrooms, all with countryside views, with latch doors and two bathrooms with baths and showers. Outside of the lounge through the French doors there is a delightful patio which is perfect for breakfast. Walking or cycling from the door to Farleton Knott, where there are glorious limestone pavements and this particular area is also prolific for butterflies and orchids on nearby Burton Fell. There are stunning views from here to the Lakeland fells and Morecambe Bay. Note: This property can be booked with Oakwood Farm East and together they sleep 9. With an adjoining door. Please email us at enquiries@curwenwoods.com to enquire about booking dates and hire rates. We look forward to welcoming you to Oakwood Farm West. Read what our guests say about Oakwood Farm West on TripAdvisor. Lovely location for the southern lakes. Cottage surrounded by fields full of livestock. Good road system allows ease of travel for the area. Would have no hesitation in returning. This cottage was as charming and delightful as it appears on the website. If privacy and relaxation is what you are after then this is perfect. I loved the gardens and the domestic animal life! Also the dressing table I could sit down in front of in the bathroom, never had one myself so it felt very nice to be able to put make up on sitting down for a change! Very nice helpful hosts, thank you. The cottage is lovely, and Thomasina was a wonderful host, providing us with bread, milk, and (what we suspected to be) goose eggs, as there are geese near the cottage! 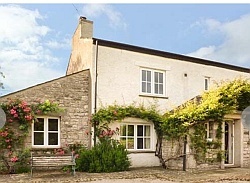 The cottage feels secluded but is close to the motorway so excellent for driving to the Lakes or Dales.